How far along are you: 37 Weeks! Baby’s Gender: We both are on the fence. Baby’s Name: We have a name for a boy or a girl. Choosing a boys name was easy for us and was decided upon months ago but the girls name has been a little more challenging but we finally decided on one. Clothes: Mostly just wearing dresses as they are the most comfortable. How are you feeling: I am feeling super pregnant. I have been having some strong Braxton Hicks contractions and lots of pelvis/groin pain. What do you miss: I miss having more clothes to wear. I miss running. The urge to “nest.” this instinct might make you want to clean house in preparation for baby. Heartburn, since baby continues to put pressure on your digestive system. Increased pressure on your abdomen (and greater urge to pee!). Cravings: nachos. pasta salad. water. lemonade. How are you sleeping: Sleeping is going alright this week, however I would say a big part of that is because I have been exhausted. Monday I worked a 10 hour day and Tuesday a 9 hour day so I have been wiped out by 8pm and have been sleeping pretty well until 3am. Then at 3am I am ready to get up but instead I have been turning Netflix on my phone on and listen/watching Bones. Workouts: This week I haven’t gotten in my workouts like I usually do because of my crazy work schedule but I did make it to prenatal yoga today. I also walked a ton of laps around the hotel during our convention so I could get a little activity in and because sitting for too long was just painful. Things I’m looking forward to: Finishing up work. Meeting our baby!! For more full term photos head over to our Facebook page (there are some pretty entertaining photos). If you haven’t stop over to our family blog, Naturally Family, then head over now and Meet The Family. This week we have been discussing this my pregnancy ups and downs, creating boundaries in bed (cats in bed), our weekend in snapshots, what we learned from our natural baby care class, babywearing 101 and a so much more. You can also check us out on Facebook and Twitter. ankles! you still have ankles! congrats on that 😀 hang in there! Really excited for you, Lindsay. Hope all goes just as you planned. 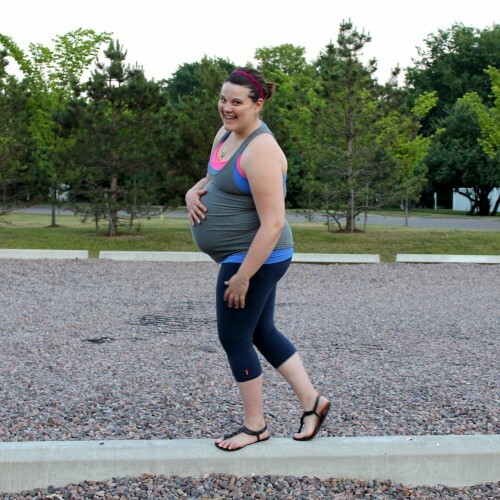 I remember the last weeks of pregnancy — people (especially men) seemed really nervous and careful about not bumping into me, but I lost touch with how big I was and seemed to bump into everything! Driving became really weird. When I went for a walk all I could think about was where the closest bathroom was. You will soon be a Mom — the greatest gift you can receive!